The apparently-young Carrizozo lava flows have proven very difficult to date. No carbon suitable for C-14 analysis has been found under the Carrizozo flows. 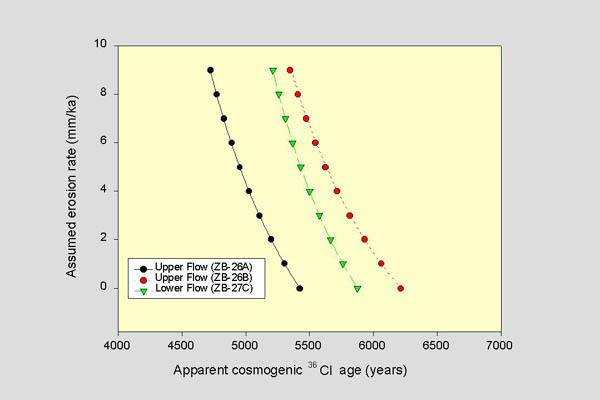 Allen (1952) estimated, based on visual observation, that the flows are less than 1000 years old, and Weber (1964) estimated the age as 1500 yrs old. These ages may have been influenced by age estimates for the geomorphically-similar and nearby McCarty's lava flow that was estimated to have erupted roughly 1000 yrs ago, based on Acoma Indian legend, and an apparent stratigraphic relationship with Pueblo I artifacts (Nichols et al., 1946). Since then, Salyards (1991) estimated an age of approximately 5000 yrs, based on secular variation magnetostratigraphy. He notes, however, that there are potential problems with the confidence of this age determination, and that an independent age determination would be necessary to confirm his age interpretation. Cosmogenic dating techniques have been successfully applied to dating of geomorphically-young surfaces, such as glacial moraines, beach terraces, and basaltic lava flows that have intact surface features, and hence have undergone little erosion (e.g. Phillips et al., 1997a and b; Phillips et al, in review, Dunbar and Phillips, 1996; Zreda et al., 1991, 1993; Zreda, 1994; Anthony and Poths, 1992, Laughlin et al., 1994). These techniques rely on measurement of cosmogenic nuclides that begin to build up as soon as a rock is exposed to cosmic rays. Therefore, cosmogenic techniques can be applied to dating of any surface that is composed of material that was not exposed to cosmic rays prior to formation of the surface, and has been exposed more-or-less continuously since. In the case of an extrusive volcanic rock, buildup of cosmogenic nuclides begins when the rock is erupted, so measurement of the ratio of a cosmogenic isotope to a non-cosmogenic isotope can provide an estimate of eruption age (Phillips et al., 1986). This page reports cosmogenic 36Cl determinations of the age of the Upper and Lower Carrizozo basaltic lava flows. These dates, plus detailed analytical methods, were published in Dunbar, 1999 (see reference list). The chlorine-36 method (Phillips et al., 1986) is based on the fact that 36Cl is dominantly produced by cosmogenic reactions near the earth's surface, primarily in the upper 1 m. of an exposed rock, as compared to a very small amount of production in the deeper subsurface. Chlorine-36 is produced in rocks at the earth's surface almost entirely by cosmic-ray-induced reactions. These include spallation of 39K and 40Ca, and thermal neutron activation of 35Cl. Cosmic rays are attenuated by interaction with the earth's magnetosphere and atmosphere, so the production of 36Cl is dependent on the latitude and elevation at which the sample was collected. Cosmic rays are also attenuated by any material overlying the dating surface, such as windblown sand or snow, so in order for a meaningful age to be obtained, the surface either must have remained bare since initial exposure, or the cover history must be accurately known. Of the six samples collected for 36Cl analysis, three yielded acceptable 36Cl results. Two of these are from the upper Carrizozo flow, and the third is from the lower. The other thee suffered from S contamination despite the attempts that were made to chemically remove S, and the AMS errors were therefore unacceptably high. The cosmogenic ages of Carrizozo samples was calculated for erosion rates between 0 and 9 mm/ka(see Figure and discussion in Dunbar, 1999). Based on the above-estimated erosion rate, the estimated cosmogenic 36Cl ages for the three Carrizozo lava flow samples are 4.9±0.5, 5.4±1.0 and 5.6±0.9 yrs, yielding an weighted average of 5.2±0.7 ka. The uncertainties cited here are based on the analytical error of the 36Cl AMS determination which is by far the largest single source of random error in the 36Cl-determined age (Phillips et al., 1997b). The 36Cl determined ages of between 4.9±0.5 to 5.6±0.9 ka for the Carrizozo lava flows are considerably older than some early estimates of between 1000 and 1500 yrs for the age of the flow (Allen , 1952). However, our ages are in good agreement with the estimates of Salyards (1991) based on secular variation magnetostratigraphy. In this paper, Salyards points out that he lacks complete confidence in his determined age because it depends on correlation to incomplete magnetic field direction curves, and that the magnetic field represented by the Carrizozo samples may reflect a more recent excursion in field direction, and hence a younger eruptive age. However, the correspondence between the 36Cl and secular variation magnetostratigraphy age suggests that the correct correlation was chosen. A He-3 age of 4.8±1.7 ka has also been determined for the Upper Carrizozo flow (Anthony et al., 1998). This age is consistent with the 36Cl and magnetostratigraphy ages, adding a further piece of evidence in support of the 5200 yr age for the Carrizozo lava flows. Although the 36Cl, He-3 and magnetostratigraphy ages are significantly older than early estimates of flow ages based on geomorphic observations of the lava flow surfaces (Allen, 1952; Weber, 1964), they appear to be consistent with now-known ages for other recent basaltic lava flows within New Mexico. For instance, radiocarbon and 36Cl dates for the McCarty's flow, in the Zuni-Bandera volcanic field indicate that it erupted around 3.5 ka ago. The McCarty's flow and the Carrizozo lava flows are geomorphically similar, upon close examination, the McCarty's flow appears distinctly younger. This interpretation is based on a greater degree of glassy pahoehoe rope preservation, larger amount of remaining iridescent glass, and more poorly developed vegetation. Furthermore, the McCarty's flow would be expected to erode more rapidly than the Carrizozo lava flow because of its northerly location and higher elevation, and hence greater rainfall and temperature variations. At the time that the early age estimates of the Carrizozo lava flows were made, the McCarty's flow was thought to be as young as 1000 yrs old (Nichols et al., 1946), based on Acoma Indian legend, and indirect stratigraphic relationship to Pueblo I artifacts (700 A.D. to 900 A.D.). Therefore, the early lava flow age estimates were internally consistent, but too young. The 36Cl dating of the Carrizozo lava flows is that the lower and upper flows were erupted with no significant time break, at least no time break of greater than 1000 yrs. This interpretation is consistent with the geochemically similar nature of the two lava flows observed by Faris (1980) as well as field observations of no soil development or significant weathering on the top of the lower flow prior to emplacement of the upper flow. In terms of understanding geological processes, such as magmatic evolution and mantle processes in the New Mexico area, a 4000-yr difference in the age of basaltic lava flow could not be considered significant. However, an important aspect of studying basaltic lava flows within New Mexico is the ability to understand the potential volcanic hazards that could threaten the state. Limburg (1990) suggests that renewed basaltic volcanism is one of the greatest potential volcanic hazards in New Mexico, and that there is around a 1% chance that some type of volcanic eruption will occur within the next 100 years. Statistical estimates, such as this one, are critically reliant on time of past volcanism as a key to future volcanic activity. Therefore, correct age estimates for eruptions, particularly young basaltic eruptions, are important in order to try to predict future eruptions within the state. Based on cosmogenic 36Cl dating, our preferred eruption date for the Carrizozo malpais is 5200 ± 700 yrs ago. This age is in good agreement with secular variation magnetostratigraphy and 3He ages, but is much older than ages based on visual observations of the flow surface morphology. The age of the Carrizozo lava flows are geomorphically-consistent with the age of the well-dated McCarty's flow. There is no apparent age difference between the upper and lower Carrizozo flows, suggesting that this two flows were formed by as an essentially monogenetic eruptive event.